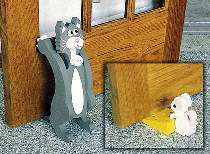 Two great door stops. The cat with tail pinched under door and a mouse on a cheese wedge. Plans drawn FULL SIZE. Cat stands 13"H. Mouse stands 4"H. Order #8684 eyes for cat, #3433 eyes for mouse, and #8394 nose for both cat and mouse.